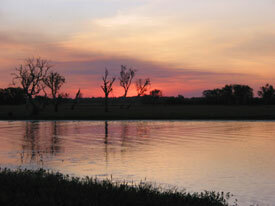 Kakadu National Park is usually the most exciting part of most visits to the Top End. 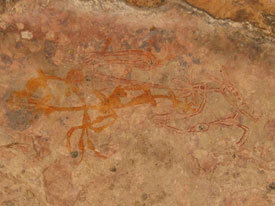 However, after four days in Arnhem Land, we were pretty sure nothing could top that. And we were almost wrong. 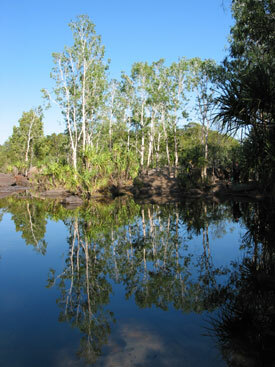 Kakadu is a World Heritage Area, which is a relatively rare honor that designates that a particular place is extremely special and important to human history. 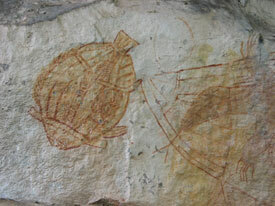 People have been painting the rocks in Kakadu for over 40,000 years. In places, the dry center of the continent emerges in the hot stone land that flows up and overlooks luscious green wetlands and forests. 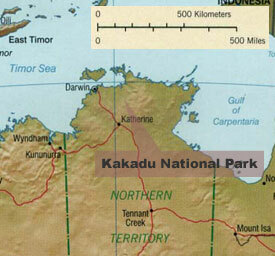 Kakadu is relatively close to Darwin. Theoretically, you could make a day trip out of visiting Jim Jim and Twin Falls, some of the most remote areas that tourist 4WD trips go. However, to really get a flavor for the place, you need at least three days to breathe it in, smell the crocodiles, survey the art, and swim, swim, swim. 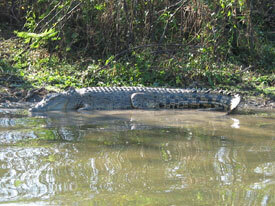 This pleasant creature is a saltwater crocodile, which will actually live in fresh or salt water. They can grow to lengths of 20 feet or more. 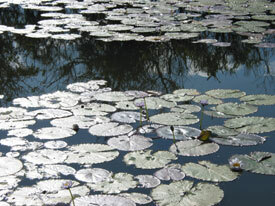 Much of the still water in the Litchfield, Kakadu, and Arnhem Land regions is covered with lilly pads, some of which sprout beautiful flowers. 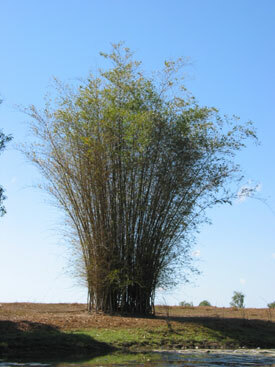 Bamboo is actually a type of grass. Really. 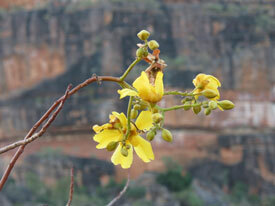 All of Australia has suffered from introduced species, which have wrecked havoc on native plants and animals. 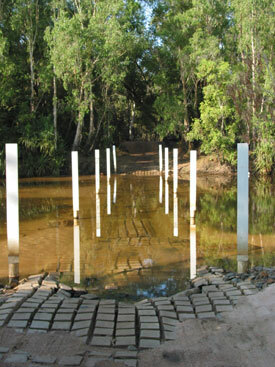 However, many introduced species, such as bamboo, which has only been in Australia for a few thousand years, have integrated well into the landscape with a minimum of disruption. 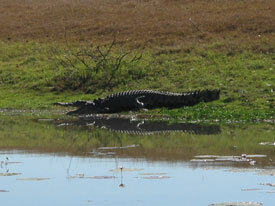 Another "salty," this one lounging near some lilly pads and flowers. This is a snake necked duck, which has to hop out of the water after about 30 minutes of fishing to stand on the bank and dry its feathers, which quickly become waterlogged while swimming. This one is drying its wings. Who said that all ducks like the rain? Crocodiles have to carefully regulate their temperature, or they cannot property digest their food. Most of the time, they have trouble getting themselves warm enough. However, this salty is sitting on the bank with its mouth open, using its tongue to cool itself down. 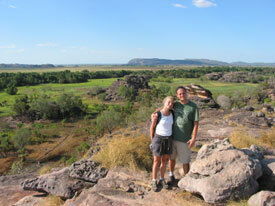 kath and truk at Ubirr Rocks. If you have seen the movie Crocodile Dundee (the first one), there is a scene set right here. 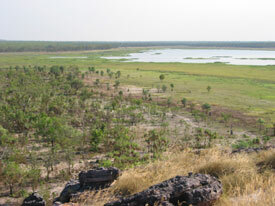 Looking the other direction off of the Ubirr Rocks, you can see across the wetlands and tropical forest. 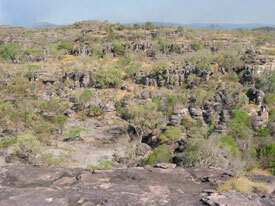 Several types of terrain meet at Ubirr Rocks, including the stone escarpments that lead up to the overlook. 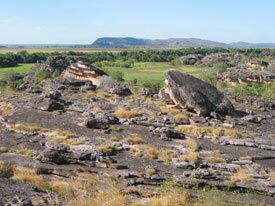 More of the Ubirr Rocks. 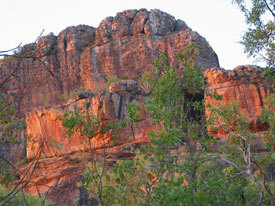 Under many of these giant boulders is some of the finest Aboriginal art in north Australia. 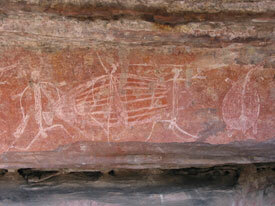 Aboriginal Art - A x-ray turtle design. 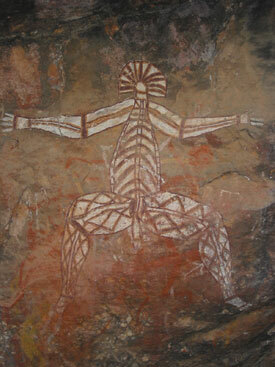 Aboriginal Art - This design tells a story. 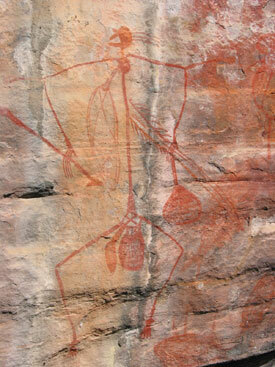 Aboriginal Art - I call this one Stick Man. 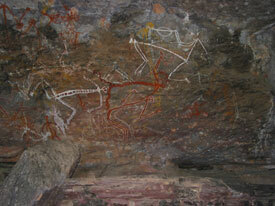 Aboriginal Art - These figures are quite old and were supposedly painted by Memis, who are ancestral spirits. 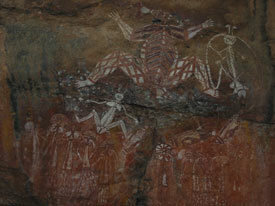 This painting was on the top of a cave ceiling, more than 10 meters off the ground. It was hard to figure out how they were able to get to that level and paint them. 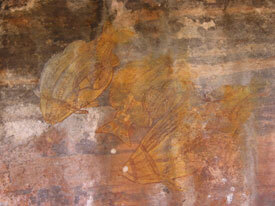 The x-ray fish designs supposedly rather new, perhaps only a few thousand years old. 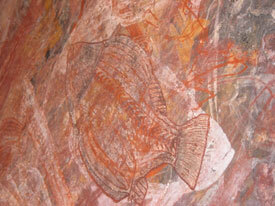 Aboriginal Art - Another (larger) fish. 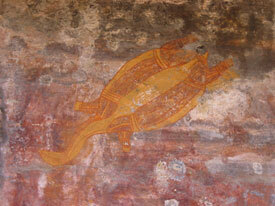 Aboriginal Art - Yellow x-ray fish. 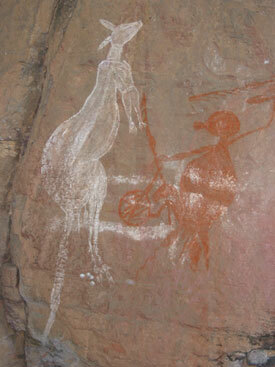 This area, some distance from Ubirr, also contains several excellent paintings. This is a very new painting (~1960) featuring a story of Namarrgon, the lightning god. Namarrgon again, a little closer up. You can always tell that the paintings with a lot of white in them are pretty new, because the white paint doesn't last as long on the rocks as the black, yellow, and red. 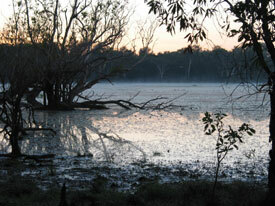 Sunrise across the misty water near our campsite at Jim Jim Billabong. 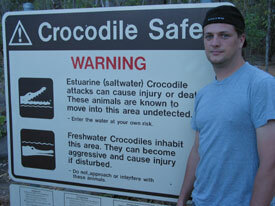 These crocodile safety signs are no joke. 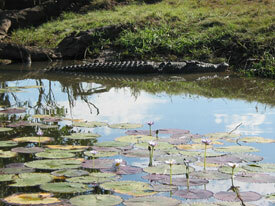 Crocs slip by the nets and get caught in traps near swimming areas all the time. All along the bank, large Styrofoam balls are tied to tree trunks, left floating the water, which rangers monitor for croc teeth marks. 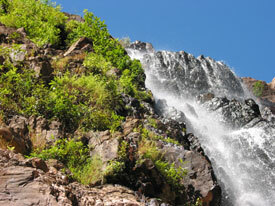 To get to Jim Jim Falls and Twin Falls, you have to cross the river. 4WD vehicles need only apply. In the driest of the Dry (such as in July), Jim Jim Falls just becomes Jim Jim Gorge, because the waterfall becomes a trickle. However, the sunlight cutting into the gorge makes for a nice picture. 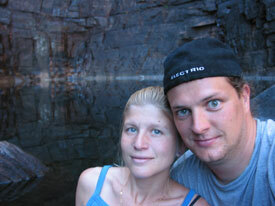 kath and truk at the Jim Jim Gorge plunge pool. 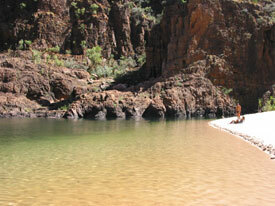 The Jim Jim Gorge plunge pool is super calm and clear. This photo only reveals part of the reflection, which seems to almost totally surrounds you. 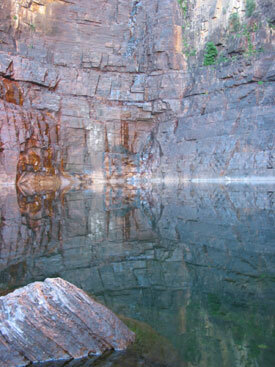 However, gorges do not have a monopoly on pleasant reflections. 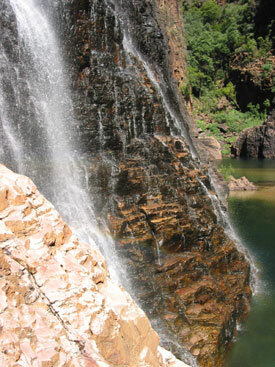 Twin Falls features two waterfalls that come down into a shallow, sandy plunge pool. 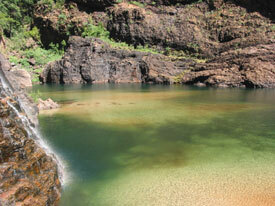 To get to Twin Falls, you have to swim (or float, if you choose the air mattress) over 500 meters each way. 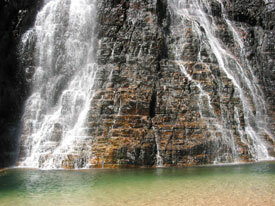 That, and the 4WD-only access, really helps to keep down the number of folks sharing the falls at a particular time. You can almost make out the rainbow in this shot of the left falls. The sand at Twin Falls apparently moves around quite a bit. The guide that took us up to this place said that you could have lunch on an island in the middle of the pool last year where there is only water this year. During every Wet, when water really crashes over the falls, it picks up the sand and moves it around, up to 2 to 3 meters of it in a particular place. The sand leads right up out of the water and reveals a white beach, perfect for sunbathing, eh, burning. 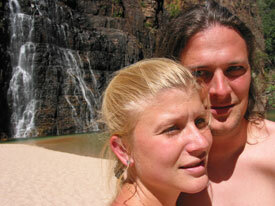 kath and truk at Twin Falls. 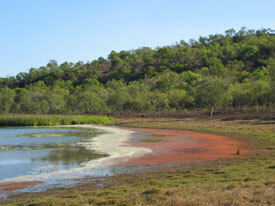 With all of the sunshine in the Top End during the Dry, green sprouts anywhere moisture can be sustained. 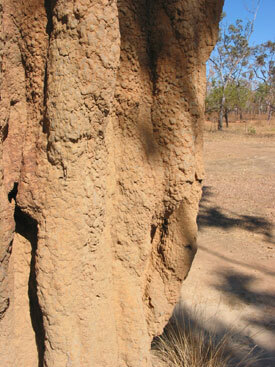 A close-up of a termite mound in Kakadu. 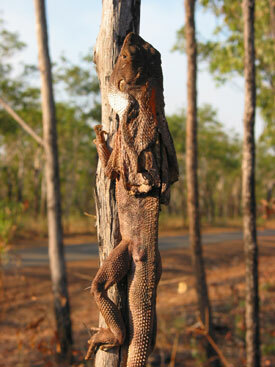 While driving back to camp one night, our guide actually noticed this frilled neck lizard hanging onto a tree beside the road. We had just passed a bushfire, and the theory is that this little guy has just crossed the road to get away from the flames and was waiting until it was safe to head home again. 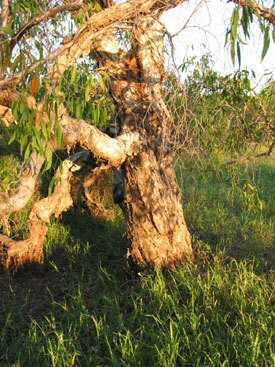 I just liked the look of this tree at Yellow Waters, another place within Kakadu. 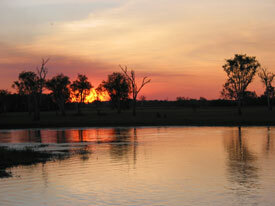 Even more sunset at Yellow Waters. 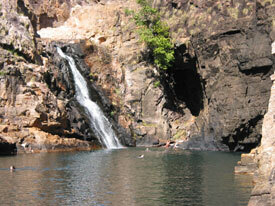 Maguk Falls, which was the last place we swam in Kakadu. 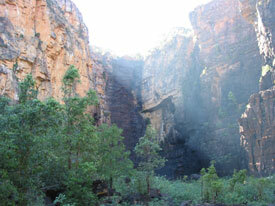 While we were swimming with a snorkel and mask, we saw several gigantic fish in Barramundi Gorge. In addition, we saw a 5-6 foot snake swimming along the bottom of the rocks. 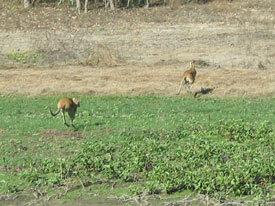 Wallabies running for the bush after we spooked them. Beside one of the billabongs formed when the Mary River recedes during the Dry, you can see some of the algae that looks like what I saw on Rottnest Island in Western Australia. 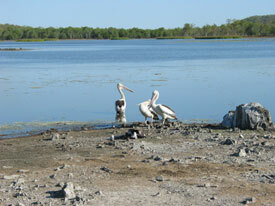 Pelicans beside the Mary River billabong. 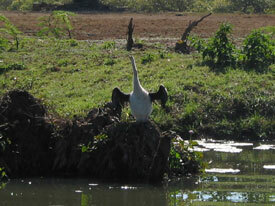 Behind the pelicans, on the little island to the right, is a big salty croc and lots of waterfowl.